I’m an English major. Okay, maybe I need to explain this a little more. I am a huge English nerd. I’ve always liked words and writing. I even liked grammar, especially because at my elementary school, I learned about the parts of speech by drawing little shapes over certain words. A verb got a big red circle. Nouns and adjectives got triangles that varied in size and coloration. Prepositions got green, sideways crescents (the inside of the curve faced down). Okay, I probably shouldn’t go off on parts of speech right now. I can save that for another day. Since I’m such a huge English nerd, it’s obvious that I like punctuation. Actually, I love punctuation. I get butterflies in my stomach talking about punctuation. I will save my ridiculously long post on how much I adore semicolons and dashes for another day. Maybe the day after I write about parts of speech on here. Even though they’re not my favorite, I think people forget how important commas are. I have trouble understanding what’s going on in a sentence that’s missing commas it so desperately needs. Why is this important, you ask? Could this outrageously nerdy post on commas actually relate to anything non-English majors care about? As you probably (hopefully?) know, the Associated Press deemed Oxford commas unnecessary. Wrong, even. At the time, I didn’t want to go into journalism outside my school paper and local paper’s teen board, so I didn’t really care. I guess I wasn’t a punctuation activist in those days. Plus I wanted to write books for a living, so I didn’t necessarily need to adhere to an AP stylebook. Sometime after I got into college, I decided to add that second major. And have I ever mentioned how the Pacific Ocean convinced me that I needed to write for travel magazines this past summer? Well yeah, that happened too. So I actually do need to care about AP style now. I don’t have many problems with AP style, but I do hate that Oxford comma rule – and it’s not just because I’d forget to take my Oxford commas out and my stories for my news writing lab would get lower grades. I know most people who read this will think, “why is this girl so pissed about something so stupid as commas?” Think all you want. I need my third comma to understand what’s going on. 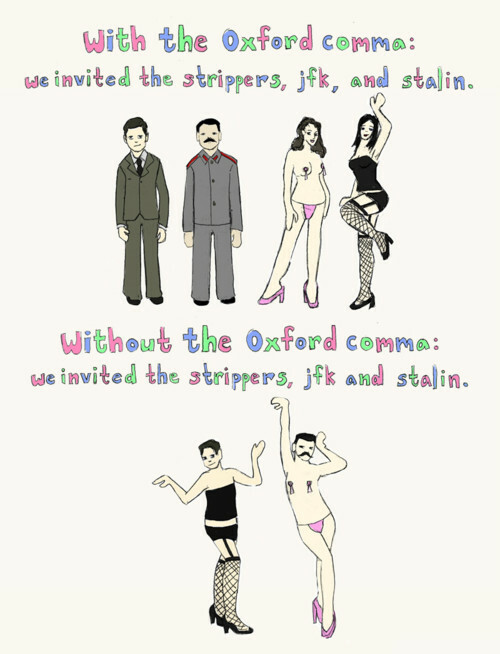 I’ve included that visual aid to help convince people who aren’t so crazy about words that Oxford commas are important. Without them, the reader is left confused. It can happen to anyone. It can happen to aspiring journalists and grammar Nazis, and I can say that because it happened to me and I am obviously both. It happened today. I was reading my news writing book because I haven’t since before I took my midterm and I kind of have a final tomorrow. There was a lot of information. So much information. And lots of lists. So many lists. And there were a bunch of words stringed together without commas and I had no idea what was going on. It didn’t happen just once, either. It happened again and again and again, and I felt like an idiot each time. I have realized that the fault isn’t mine. Associated Press, you did a terrible thing when you discouraged the use of the Oxford comma. Did you think it would make the reading process easier? It really doesn’t. It confuses me, and I am a pretty well-read person (I’m not trying to sound facetious or anything, but I am). I know all you want to do is make news content easier for your readers. I know you had good intentions, I do. Maybe this year, when you’re changing state abbreviations yet again, you’ll realize that omitting the Oxford comma from your stylebook was a mistake.